CowParade is an international public art exhibit that has been featured in major world cities. 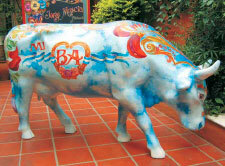 Fiberglass sculptures of cows are decorated by local artists, and distributed over the city centre, in public places such as train stations, important avenues, and parks. They often feature artwork and designs specific to local culture, as well as city life and other relevant themes. After the exhibition in the city, which may last many months, the statues are auctioned off and the proceeds donated to charity. There are a few variations of shape, but the three most common shapes of cow were created by Pascal Knapp, a Swiss-born sculptor who was commissioned to create the cows specifically for the CowParade series of events. Pascal Knapp owns the copyrights to the standing, lying, and grazing cow shapes used in the CowParade events. The concept of "cow parade" has its origins in Zürich, Switzerland, in 1998 by artistic director Walter Knapp, it is based on an idea which was realised in the same city for the first time in 1986: Lions as the symbol of Zurich were painted and then on display throughout the city. The concept was brought to the United States when Chicago businessman Peter Hanig, organized an event in Chicago in 1999 called Cows on Parade. The success of this venture inspired many other cities to host similar fundraising projects. The idea has been taken up by other cities which have chosen animals for public art projects with painted fiberglass sculptures (see Similar projects). Two of the 104 decorated pigs on display in the English city of Bath. This was a public art event, called "King Bladud's Pigs in Bath". Pig sculptures were on display around the city through the summer of 2008. Vacalero cow, in Paseo de los Heroes, from Tijuana CowParade 2008. CowParade Facts for Kids. Kiddle Encyclopedia.